Have you visited the Joy of Tea stand in Epcot's World Showcase? Have you sampled their signature drink, "Tipsy Ducks in Love"? I have never been to Joy of Tea. I'll have to look for it on my next trip! I had the BEST cocktail there. I asked the ladies working the booth what was their favorite and walked away with some sort of sake/green tea frozen concoction that was out of this world! Definitely a stop for us ... especially on a hot day. Great "J"! Love the Joy of Tea! It's a perfect place to stop and recharge! I had the BEST cocktail there during the F&G. 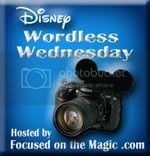 Thanks for sharing and joining The Disney Wordless Wednesday Blog Hop today! Love the Joy of Tea! What a great photo. I LOVE the Joy of Tea. It's one of the spots we have to stop at every trip. Great shot! Mango Green Tea Slush please, great J for sure! I'm not a tea drinker, but my grandparents are. May have to point them this way next time. I know right where this is, but I haven't purchased any tea there. I'm going to try something next visit. Haven't tried anything from the Joy of Tea... yet! Great "J" post! A neat "J" picture! I haven't been but it looks like like a great place to stop. I've never been...looks cool though! We got egg rolls there a few years ago. Best food I enjoy is the tie-dye cheesecake at Pop Century! Love it! Great photo Kelli! I have heard wonderful things about the Joy of Tea so I must check it out soon.